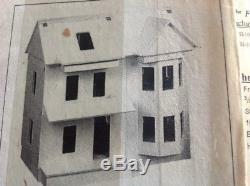 VINTAGE front-opening Half-scale (1:24) VICTORIAN DOLLHOUSE SHELL KIT (unassembled). Kit is listed as used but has never been assembled and is in excellent condition. Overall dimensions when assembled are 16-5/8" wide x 11-1/4" deep x 16-1/2 high. 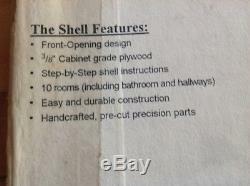 Front-opening design, 3/8 cabinet grade plywood, step-by-step instructions, 10 rooms (including bathroom and hallways), easy and durable construction with handcrafted pre-cut precision parts. This kit can be assembled in time for a holiday gift for that special little someone or think of it as a project both of you can work on as a true bonding experience. NOTE: Photo of assembled house is wrinkled and is not indicative of the quality of the product. CAN BE PICKED UP LOCALLY. 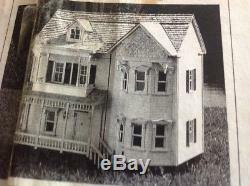 The item "DOLLHOUSE VINTAGE VICTORIAN SHELL KIT HALF-SCALE (124) used but never assembled" is in sale since Monday, November 12, 2018. This item is in the category "Dolls & Bears\Dollhouse Miniatures\Doll Houses". The seller is "minimadness17" and is located in Massapequa, New York. This item can't be shipped, the buyer must pick up the item.